Here's a small piece done for a charity auction. I like putting the green with the orange and this one also has a bit more murk than usual. She seems to be an inhabitant of Toybox world. Here's a bizarre piece that is part of the current i am 8 bit show, an exhibition of artwork inspired by the classic era of video games. Any time I've been involved with the show I've taken the opportunity to depict my favorite malevolent game character, Sinistar. This painting depicts him in what could be considered a moment of conflict for his countless evil deeds. 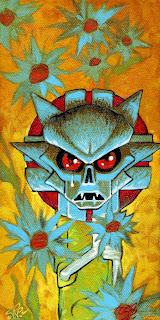 The i am 8 bit gallery lists this little painting for sale here.